The protective immunity induced by the whole-killed parasite vaccine against malarial blood-stage infection is dependent on the CD4+ T cell response. However, the mechanism underlying this robust CD4+ T cell response elicited by the whole-killed parasite vaccine is still largely unknown. In this study, we observe that immunization with Plasmodium yoelii–parasitized RBC lysate activates complement C5 and generates C5a. However, the protective efficacy against P. yoelii 17XL challenge is considerably reduced, and the malaria-specific CD4+ T cell activation and memory T cell differentiation are largely suppressed in the C5aR-deficient (C5aR−/−) mice. An adoptive transfer assay demonstrates that the reduced protection of C5aR−/− mice is closely associated with the severely impaired CD4+ T cell response. This is further confirmed by the fact that administration of C5aR antagonist significantly reduces the protective efficacy of the immunized B cell–deficient mice. Further study indicates that the defective CD4+ T cell response in C5aR−/− mice is unlikely involved in the expansion of CD4+CD25+Foxp3+ T cells, but strongly linked to a defect in dendritic cell (DC) maturation and the ability to allostimulate CD4+ T cells. These results demonstrate that C5aR signaling is essential for the optimal induction of the malaria-specific CD4+ T cell response by the whole-killed parasite vaccine through modulation of DCs function, which provides us with new clues to design an effective blood-stage subunit vaccine and helps us to understand the mechanism by which the T cell response is regulated by the complement system. Malaria remains the most devastating disease worldwide. Approximately 40% of the world’s population is at risk for malaria, and 225 million new cases occur annually, resulting in 781,000 deaths each year (World Malaria Report 2010). Malaria is caused by an infection with protozoa of the genus Plasmodium. After the parasite is released from hepatocytes, it invades RBCs and initiates the development of the blood stage of infection, which causes the clinical symptoms, such as fever, anemia, and even cerebral malaria. A vaccine against the blood stage of malaria is the most cost-effective strategy to reduce the morbidity and mortality caused by the malaria parasite infection. Although great efforts have been made in the past years, there is still no effective blood-stage subunit vaccine available for malaria (1). Most of the current blood-stage subunit vaccines being developed aim to induce protective Abs against the surface proteins of the merozoite, including merozoite surface protein-1 (2), apical membrane Ag-1 (3), erythrocyte-binding Ag-175 (4), and glutamate-rich protein (5). The goal is to block the invasion of the malaria parasite into the RBC through the induction of Abs against these proteins. Although the adjuvant, such as CpG, could enhance the malaria-specific Ab response (6), a field study revealed that the blood-stage subunit vaccines could not protect against clinical malaria (7). Genome-wide analysis revealed that most of the proteins on the surface of the infected red cell exhibit extensive antigenic variation and polymorphisms under selection pressure (8), and overcoming this characteristic was regarded as a great challenge to the development of blood-stage subunit vaccines against malaria. Because of the failure of subunit malaria vaccines, a variety of whole-malaria parasite vaccines, including infection treatment vaccine (9), killed malaria parasite vaccine (10), and genetically attenuated blood-stage malaria vaccine (11, 12), have garnered more attention from researchers in recent years. Evidence has shown that the whole-killed parasite vaccine could induce the host to generate protective immunity against blood-stage malaria parasites in both human and animal models (10, 13). In contrast to subunit vaccines, the protective immunity induced by the whole-killed blood-stage vaccine was dependent on malaria-specific CD4+ T cells, IFN-γ, and NO (10). In addition, the CD4+ T cell response induced by the whole-killed blood-stage vaccine has the theoretical advantage of targeting internal Ags. These Ags are more likely to be conserved, and may provide cross-strain protection (10). Therefore, the induction of a robust malaria-specific CD4+ T cell response was regarded as a promising new vaccine development strategy (14). Although hemozoin, acting through TLR9, was recently shown to be involved in the immunogenicity of the whole blood-stage malaria vaccine (15), the mechanism of the malaria-specific CD4+ T cell response elicited by the whole blood-stage vaccine is still unclear. Complement components are regarded as an integral arm of innate immunity. However, in recent years, increasing evidence suggests that complement components were also important in orchestrating adaptive immunity (16). Other than the modulation of B cell activation and Ab production by complement (17, 18), emerging evidence has shown that complement components were also involved in the regulation of T cell responses (19). Early studies showed that C3 could promote T cell activation and recruitment to reject allograft renal transplants (20). Recently, increasing evidence has indicated the important role of C3 and anaphylatoxin C5a in the regulation of CD4+ and CD8+ T cell responses in viral and intracellular bacterial infections, including influenza virus (21), lymphocytic choriomeningitis virus (21), and Listeria monocytogenes (22). However, the possible role of complement C5a in the modulation of the CD4+ T cell response elicited by the whole-malaria parasite vaccine has never been defined. In this study, we have determined the role of C5aR signaling in the optimal priming of the CD4+ T cell response induced by the whole blood-stage malaria vaccine. Our data showed that the protective efficacy against malaria infection of immunized C5aR−/− mice was severely impaired, which was closely associated with the defective CD4+ T cell response in C5aR−/− mice following immunization. To understand the mechanism of the defective CD4+ T cell response in C5aR−/− mice, we compared the frequency of CD4+CD25+Foxp3+ T cells and dendritic cell (DC) function between the wild-type (WT) and the C5aR−/− mice, and found that DC function was defective in the immunized C5aR−/− mice. These studies not only further deepen our understanding of the regulation of the T cell response by complement components, but also shed new light on the design of an effective blood-stage subunit vaccine for malaria. C5aR−/− mice (BALB/c background), CD4+ T−/− mice (B6.129S2-cd4 tm1Mak/J, C57BL/6 background), and B cell–deficient mice (μMT, C57BL/6 background) were obtained from The Jackson Laboratory (Bar Harbor, ME). Specific pathogen-free BALB/c and C57BL/6 mice, 6–8 wk of age, were purchased from the Beijing Animal Institute. All animal protocols were reviewed and approved by the Animal Ethics Committee of the Third Military Medical University Institute of Medical Research. The lethal strain Plasmodium yoelii 17XL was obtained from MR4 (Malaria Research and Reference Reagent Resource Center, Manassas, Virginia) and maintained by i.p. passages in mice. The whole-parasite vaccine was prepared, and animals were immunized according to the method described previously (10), but with some modifications. Briefly, when the parasitemia of P. yoelii 17XL-infected mice reached 30–40%, blood was collected and washed with sterile PBS with centrifugation at 1000 × g for 10 min. After resuspension in sterile PBS, total RBCs were counted, and the parasite was adjusted to the desired concentrations according to parasitemias. The parasites were then killed by three freeze-thaw cycles. An amount of Ag equivalent to 1.5 × 107 parasitized RBCs (pRBCs) was admixed thoroughly with aluminum hydroxide (Pierce) and then injected s.c. on the abdomen of mice. Following the initial immunization, the mice were given two i.p. booster immunizations with the same amount of Ag every 2 wk. To block C5aR signaling during immunization, μMT mice were injected i.v. with 100 μg/kg W54011 (Merck Bioscience), a specific nonpeptide C5aR antagonist (23), on days −1, 1, 3, and 5 during each immunization. Animals were challenged with 1 × 106 P. yoelii 17XL pRBCs delivered i.p. 2 wk after the final immunization. P. yoelii 17XL crude parasite Ag was prepared, as described previously (10, 24). Briefly, P. yoelii 17XL-infected mouse blood was collected, washed in PBS, and lysed with 0.01% saponin (Sigma-Aldrich) at 37°C for 20 min. The pellet was then resuspended in PBS and sonicated. Nunc MaxiSorp Immunoplates (Nalge Nunc) were coated with parasite Ag at a concentration of 10 μg/ml overnight at 4°C. Sera (100 μl) from immunized WT and C5aR−/− mice were added to the plates and incubated at room temperature for 2 h. After washes with washing buffer, HRP-conjugated anti-mouse IgG, IgG2a, and IgG1 (Sigma-Aldrich) were added to the plates and incubated for 2 h. Hyperimmune sera (HIS) were collected from the mice that had recovered from the P. yoelii 17XNL infection. The enzymatic activity was visualized after the addition of 3,3′,5,5′-tetramethylbenzidine (Sigma-Aldrich). The absorbance at 450 nm was measured using a spectrophotometer. Splenocytes were isolated and aliquoted into 96-well plates at a concentration of 5 × 105 cells/well. Cells were stimulated with 5 μg/ml Con A, 1 × 106 pRBCs, or 1 × 106 normal RBCs. Cells were cultured for 96 h. For proliferation assays, the cells were stained with CFSE using a Vybrant CFDA SE Cell Tracer Kit (Invitrogen), according to the manufacturer’s instructions prior to cell culture. For intracellular staining, cells were incubated with PMA (0.025 μg/ml; Sigma-Aldrich), ionomycin (1 μg/ml, Sigma-Aldrich), and brefeldin A (10 μg/ml; Sigma-Aldrich) for final 4–6 h, as described previously (10). The cells were then stained with anti-mouse CD4 allophycocyanin (eBioscience) and PE IFN-γ (eBioscience) and analyzed by flow cytometry. Single-cell suspensions of splenocytes were prepared 2 wk after the final immunization, as described above. For regulatory T cell analysis, 5 × 105 cells were incubated with anti-mouse CD4 allophycocyanin (eBioscience), anti-mouse CD25 PE (eBioscience), and anti-mouse Foxp3 FITC (eBioscience) after the cells were permeabilized with fixation/permeabilization agent (eBioscience). To analyze the phenotype of the memory CD4+ T cells, the cells were incubated with anti-mouse CD4 FITC (eBioscience), anti-mouse CD62L allophycocyanin (eBioscience), and anti-mouse CD44 PE (eBioscience). The cells were analyzed using flow cytometry. For serum transfer, naive BALB/c mice were injected i.v. on days −1, 0, and 1 with 0.2 ml serum from immunized WT or C5aR−/− mice, as described previously (10). Recipients were challenged with 2.5 × 104 P. yoelii 17XL pRBCs on day 0, and both parasitemia and the survival rate were determined. For splenic CD4+ T cell transfer, CD4+ T cells were purified from single-cell suspensions of splenocytes with positive selection using a MACS cell separation system (Miltenyi Biotec), according to the manufacturer’s instructions. For the adoptive transfer experiments, 5 × 106 purified CD4+ T cells (>95% purity) from immunized WT and C5aR−/− mice were injected i.v. into naive recipient mice. The mice were then challenged with 2.5 × 104 P. yoelii 17XL 24 h later. Splenic DCs from both WT and C5aR−/− BALB/c mice were isolated 2 d after a single immunization with the whole-malaria vaccine. Briefly, spleens from naive or immunized mice were digested, as described previously (25), and DCs were isolated with anti-CD11c MACS beads using a MACS cell separation system (Miltenyi Biotec), according to the manufacturer’s instructions, and the DC purity determined by FACS analysis is >90%. For the MLR experiments, 5 × 104 purified DCs from the immunized WT and C5aR−/− mice were cultured in triplicate with 2 × 105 CD4+ T cells purified from naive C57BL/6 mice, as described above. Five days later, IFN-γ level in the supernatants was detected by using a highly sensitive mouse IFN-γ–specific ELISA kit (Ready-SET-Go! ; eBioscience), according to the manufacturer’s instructions. Briefly, after the coated plate was blocked, 2-fold serial dilutions of standards and samples were added to the wells and incubated at room temperature for 2 h. Detection Ab (100 μl) was then added to the plate and incubated at room temperature for 1 h. After washes with washing buffer, avidin-HRP (100 μl) was added to the plates for 30 min at room temperature. The enzymatic activity was visualized after the addition of substrate solution. The absorbance at 450 nm was measured using a spectrophotometer. Finally, the concentration of samples could be obtained according to the standard curve. For proliferation assay, the cells were further pulsed with [3H]thymidine (1 μCi/well) for 8 h, and the uptake of radioactivity was measured. Differences between samples were analyzed using the SPSS 12.0 software. For the unpaired Student t test and two-way ANOVA, p values <0.05 were regarded as statistically significant. Initially, we determined whether immunization with pRBC lysate could activate complement. As shown in Fig. 1A, the serum level of C5a was significantly elevated in both the WT and C5aR−/− mice 2 d postimmunization (p < 0.05). The C5a levels then returned to baseline at days 4 and 6 in serum of both WT and C5aR−/− mice. The data suggested that complement was immediately activated in both WT and C5aR−/− mice by whole-parasite vaccine immunization. The protective efficacy against blood-stage challenge was markedly reduced in C5aR−/− mice. (A) C5a level in the serum of WT (n = 3) and C5aR−/− (n = 3) mice at 2, 4, and 6 d following immunization with pRBC lysate. (B and C) Naive or immunized WT (n = 5) and C5aR−/− (n = 5) mice were challenged i.p. with P. yoelii 17XL pRBC 2 wk after the last immunization, and both parasitemia (B) and survival rate (C) were recorded. The results are representative of three independent experiments. The data are presented as mean ± SD; *p < 0.05. C5aR, but not C5L2, is the functional receptor for C5a (26), and the role of C5a/C5aR signaling in the induction of protective immunity by a whole-parasite vaccine has never been reported. Therefore, we assessed the protective efficacy of the whole-parasite vaccine-immunized C5aR−/− mice against a blood-stage challenge with P. yoelii 17XL. 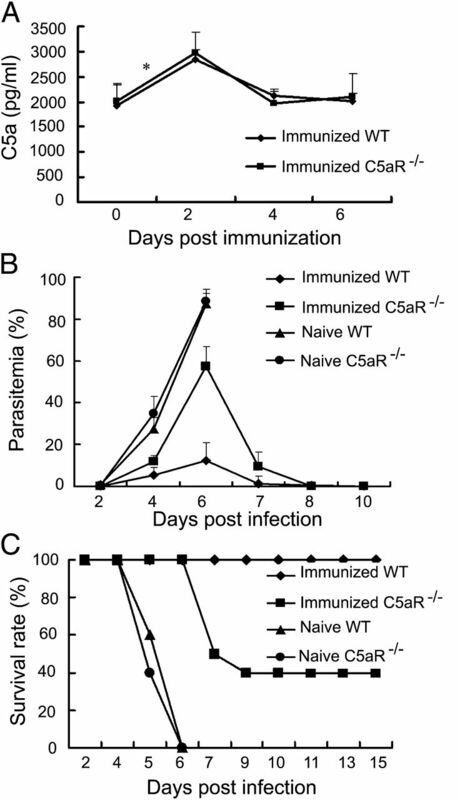 Although similar parasitemias were observed in both the naive WT and C5aR−/− mice, the growth of P. yoelii 17XL was greatly suppressed in the whole-parasite vaccine-immunized WT mice. In these mice, the peak parasitemia was only 10% at day 6, and parasites were cleared from all mice at day 8 postchallenge (Fig. 1B, 1C). This finding is consistent with a previous report of the high protective efficacy induced by a whole blood-stage malaria vaccine (13). In contrast to the immunized WT mice, the protective immunity of the immunized C5aR−/− mice was severely impaired. Six days after P. yoelii 17XL challenge, the peak parasitemia in the immunized C5aR−/− mice reached ∼60%, resulting in only a 40% survival rate of these mice at day 9 (Fig. 1B, 1C). These results demonstrated that the protective efficacy was largely reduced in the whole-parasite vaccine-immunized C5aR−/− mice. Although either infection treatment vaccine, whole-killed blood-stage malaria vaccine, or genetically attenuated blood-stage malaria vaccine could induce protective immunity, their protections were variously dependent on the Ab and/or CD4+ T cell response (10, 12, 24). To understand the protective mechanism induced by our whole-killed P. yoelii 17XL vaccine, we compared the protective efficacy of the immunized WT with both the immunized CD4+ T cell–deficient mice and B cell–deficient mice. The growth of malaria parasite in either naive CD4+ T cell–deficient or naive B cell–deficient mice was comparable to that of naive WT mice postchallenge, indicating no significant inhibitory effect of either the CD4+ T cell response or Ab response on malaria parasite in these mice (Fig. 2). This is consistent with a previous report about the important role of innate immune response against malaria parasite during primary wave of parasitemia (27). As expected, all the immunized WT mice survived and cleared the parasites at 14 d postchallenge. However, the growth of malaria parasite in the immunized CD4+ T cell–deficient mice was as rapid as that in the naive WT mice, and only one-third mice could prolong the survival time for 2 d (Fig. 2A, 2C). As for the immunized B cell–deficient mice, the parasitemia was significantly lower than that of the naive WT mice (p < 0.01), but higher than that of the immunized WT mice (p < 0.01), and two-thirds mice could prolong the survival time for 3–5 d (Fig. 2B, 2D). Thus, our data suggested that both the CD4+ T cells response and Ab response were necessary for the protection of our killed P. yoelii 17XL vaccine. 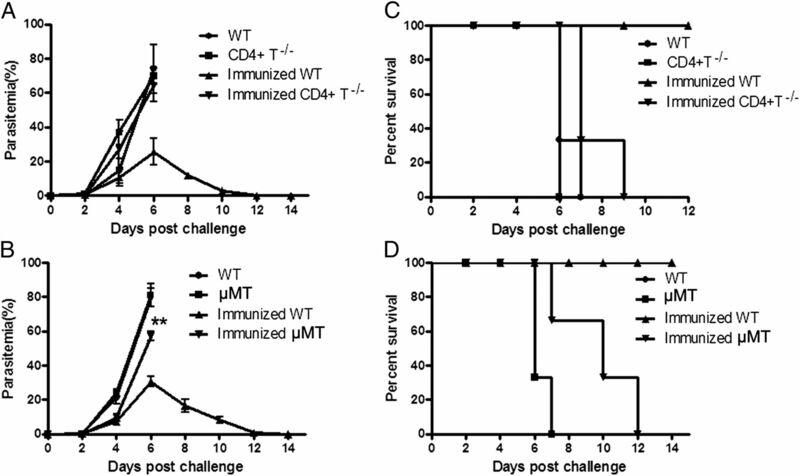 The protective efficacy of the immunized CD4+ T cell–deficient and B cell–deficient mice (μMT). WT (n = 6), CD4+ T cell–deficient, and μMT mice (n = 6), immunized or not immunized with P. yoelii 17XL lysate, were challenged i.p. with 1 × 106 pRBC. Both parasitemia (A, B) and survival rate (C, D) were recorded. The results are representative of two independent experiments. The data are presented as the mean ± SD; **p < 0.01. Considering the important role of both the Ab response and CD4+ T cell response in our vaccine model, we compared Ab levels and CD4+ T cell responses between the WT and C5aR−/− mice following immunization. As shown in Fig. 3, both total IgG and IgG2a levels in the serum of immunized C5aR−/− mice were comparable to the HIS and those in the immunized WT mice. Although the levels of IgG1 in the C5aR−/− mice were slightly lower than that in the WT mice, there was no significance (p > 0.05). Malaria-specific IgG levels in the serum of WT and C5aR−/− mice following immunization. Two weeks after the final immunization, levels of total IgG, IgG1, and IgG2a in the serum of both pRBC lysate-immunized WT (n = 5) and C5aR−/− mice (n = 5) were detected by ELISA. Sera from PBS-immunized mice served as the negative control, and HIS served as the positive control. The results are from three independent experiments. The data are presented as the lg of Ab titer and expressed as the mean ± SD. ns, No significance. Interestingly, the proliferative rate of CD4+ T cells from the immunized C5aR−/− mice was almost 3 times lower than that of the immunized WT mice (6.33 versus 19.7%, p < 0.05; Fig. 4A, 4B), indicating the proliferative capacity of CD4+ T cells from C5aR−/− mice was greatly suppressed. The percentage of IFN-γ–producing CD4+ T cells from the immunized C5aR−/− mice was also only half of that of the immunized WT mice, when stimulated with pRBC lysate (1.8 versus 3.61%, p < 0.05; Fig. 4C, 4D). 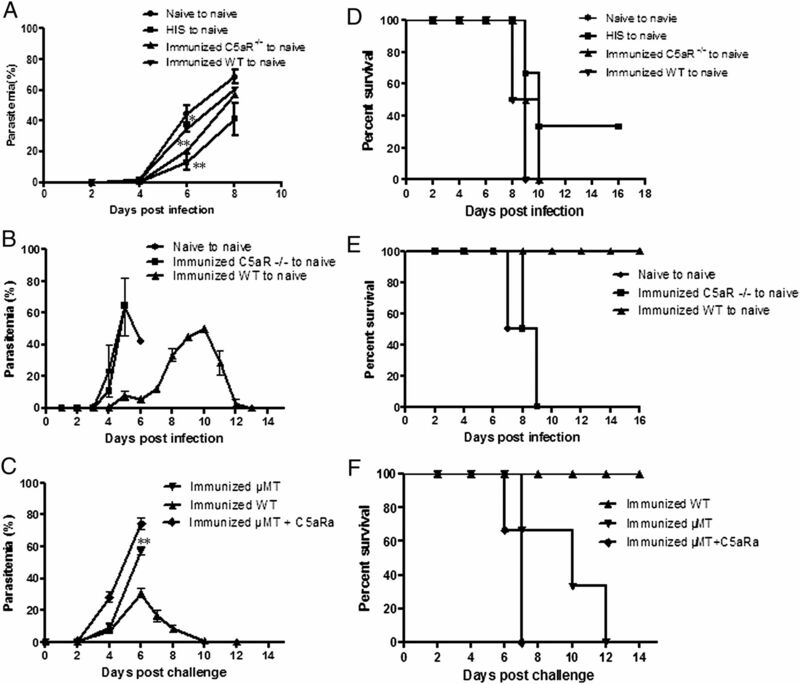 The impaired CD4+ T cell response in the immunized C5aR−/− mice was not due to an intrinsic defect because both the percentage of IFN-γ–producing CD4+ T cells and the proliferative capacity of these cells were similar between the immunized C5aR−/− and WT mice when stimulated with Con A or normal RBC (nRBC) lysate (Fig. 4). In addition, we also observed that both the effector memory T cells (CD62LlowCD44high) and central memory T cells (CD62LhighCD44high) of the immunized C5aR−/− mice were >3 times (1.92 versus 5.89%) and 5 times (4.34 versus 25.59%) lower than that of the immunized WT mice, respectively (Fig. 5). All the data demonstrated that both the splenic malaria-specific CD4+ T cell activation and memory T cell differentiation were severely impaired in the immunized C5aR−/− mice. Splenic CD4+ T cell activation in both immunized WT and C5aR−/− mice. The splenocytes were isolated from the immunized WT (n = 5) and C5aR−/− mice (n = 5) 2 wk after the final immunization. The splenocytes were labeled with CFSE and then incubated with ConA, nRBC, or pRBC for 96 h. The intensity of CFSE on the CD4+ T cells was analyzed by flow cytometry. 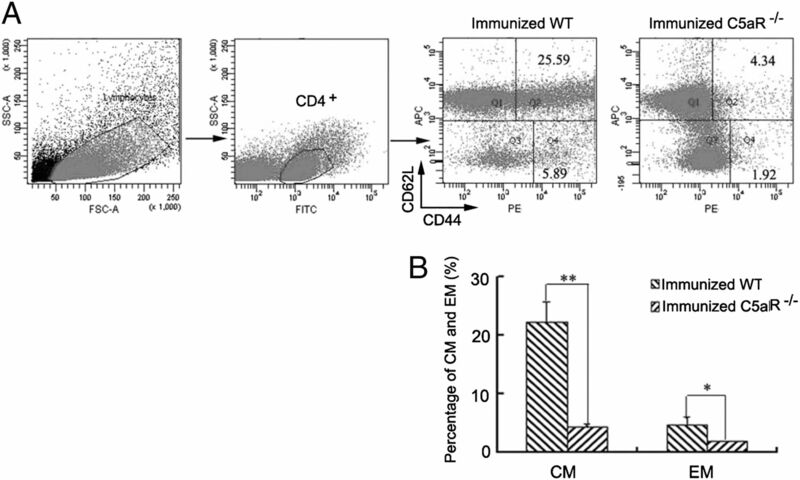 (A) A representative result of the proliferation of CD4+ T cells from the immunized WT and C5aR−/− mice. (B) Statistical analysis of the proliferation of CD4+ T cells from the immunized WT and C5aR−/− mice. To detect IFN-γ–secreting CD4+ T cells, splenocytes from the immunized WT and C5aR−/− mice were stimulated with ConA, nRBC, or pRBC for 96 h. The IFN-γ–secreting CD4+ T cells were analyzed by flow cytometry. (C) A representative result showing the percentage of IFN-γ–secreting CD4+ T cells from the immunized WT and C5aR−/− mice. (D) Statistical analysis of the frequency of IFN-γ–secreting CD4+ T cells from the immunized WT and C5aR−/− mice. Three independent experiments were performed. The data are presented as the mean ± SD; *p < 0.05. 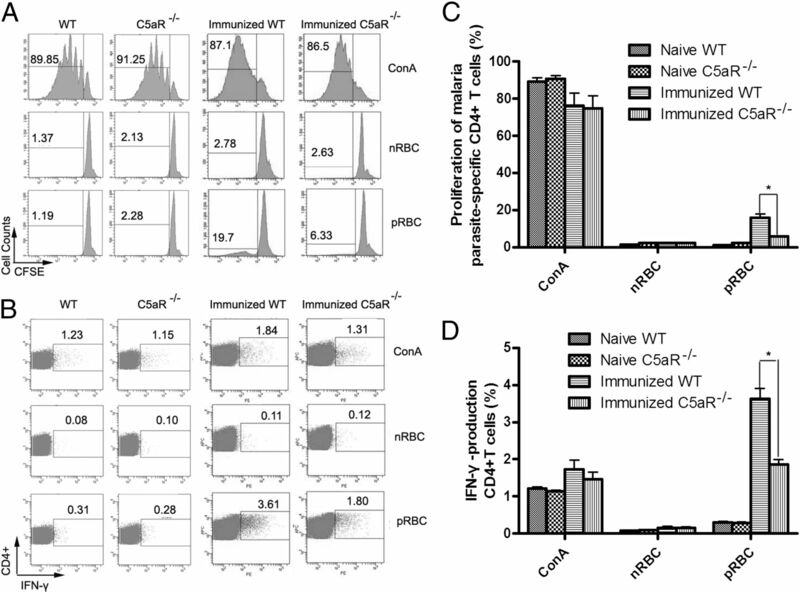 Differentiation of memory CD4+ T cells from the immunized WT and C5aR−/− mice. Splenocytes were isolated from the immunized WT (n = 5) and C5aR−/− mice (n = 5) 2 wk after the final immunization. (A) A representative FACS analysis of both effector memory (EM) (CD44highCD62Lhigh) and central memory (CM) (CD44highCD62Llow) CD4+ T cells. (B) Statistical analysis of both EM and CM from the immunized WT and C5aR−/− mice. Three experiments were performed. The data are presented as the mean ± SD; *p < 0.05, **p < 0.01. To further investigate whether the impaired splenic CD4+ T cell response and the Ab response contribute to the reduced protective efficacy of the immunized C5aR−/− mice, we performed adoptive transfer assays of both serum and splenic CD4+ T cells. As a result, the parasitemia was much lower in mice transferred with HIS than that of mice that received the serum of naive mice after 6 d postinfection (p < 0.01). Also, ∼30% of mice transferred with HIS could survive. The parasitemia on day 6 in mice that received serum either from the immunized C5aR−/− mice or the immunized WT mice was significantly lower than that of mice that received serum from naive mice (Fig. 6A, C5aR−/− to naive versus naive to naive, p < 0.01; WT to naive versus naive to naïve, p < 0.05), but there was no significant difference of survival rate among the mice that received serum either from naive mice, immunized WT mice, or immunized C5aR−/− mice (Fig. 6D). This might be explained as an inadequate quantity of serum was transferred in our study. Adoptive transfer of splenic CD4+ T cells and serum from both immunized WT and C5aR−/− mice into naive mice. (A and D) Serum (100 μl) from the immunized WT and C5aR−/− mice was injected i.v. into each naive mouse (n = 3) at days −1, 0, and 1. Mice transferred with HIS were also included as control; all mice were subsequently challenged with P. yoelii 17XL at 0 d; and both the parasitemia (A) and survival rate (D) were determined. (B and E) Splenic CD4+ T cells purified from the immunized WT or C5aR−/− mice were transferred to a syngeneic, naive recipient mouse (n = 3) and then challenged i.p. with P. yoelii 17XL pRBC. Both parasitemia (B) and survival rate (E) were monitored. (C and F) μMT mice were immunized with P. yoelii 17XL lysate and injected with PBS or C5aR antagonist W54011. Two weeks after final immunization, mice were challenged with P. yoelii 17XL, and both parasitemia (C) and survival rate (F) were recorded. C5aRa, C5aR antagonist. The results are representative of three independent experiments. The data are presented as the mean ± SD; *p < 0.05, **p < 0.01. However, compared with the control mice, P. yoelii 17XL growth was severely suppressed in mice that received CD4+ T cells from the immunized WT mice, and the parasitemia was <10%, even 8 d postinfection (Fig. 6B, 6E). Although the parasitemia increased over time, all of the parasites in the mice were cleared at day 20, indicating that the protection was transferred. In contrast, P. yoelii 17XL grew rapidly in mice that received CD4+ T cells from the C5aR−/− mice, and all of the mice died 7 d postinfection due to uncontrolled parasitemia, although the parasite growth was slightly inhibited at an early stage (Fig. 6B, 6E). Our data supported the observation that the reduced protective efficacy in C5aR−/− mice was closely associated with the defective CD4+ T cell responses. To further confirm the regulatory role of C5aR signaling in CD4+ T cell response, μMT mice were injected i.v. with W54011, a specific nonpeptide C5aR antagonist (23), on days −1, 1, 3, and 5 during each immunization. As shown in Fig. 6C and 6F, malaria parasite in the immunized B cell–deficient mice treated with C5aR antagonist grew more rapidly than that in the immunized B cell–deficient mice (p < 0.01), and mice died for only 1-d delay than the naive WT mice. The data further confirmed the possibility that C5a/C5aR signaling could play a protective role via the priming CD4+ T cell response. Natural and inducible regulatory T cells inhibit the activation of CD4+ T cells, and the absence of C5a/C5aR signaling may enhance the expansion of Foxp3+ regulatory T cells (28). Therefore, we investigated whether the impaired CD4+ T cell response in C5aR−/− mice was a result of the expansion of regulatory T cells. We found that the frequency of CD4+CD25+Foxp3+ T cells in WT and C5aR−/− mice moderately increased following immunization (p < 0.05; Fig. 7A) and no significant difference in the regulatory T cell frequency was observed between the immunized or naive C5aR−/− and WT mice (Fig. 7B), suggesting that C5aR deficiency did not significantly promote the expansion of the regulatory T cells in this model, and the impaired CD4+ T cell response of immunized C5aR−/− mice was most likely not due to the expansion of the regulatory T cells. The frequency of splenic regulatory T cells was comparable between the immunized WT and C5aR−/− mice. Two weeks after the final immunization, splenocytes were isolated from the immunized WT and C5aR−/− mice. (A) A representative FACS analysis of CD4+CD25+Foxp3+ regulatory T cells. (B) Statistical analysis of the frequency of regulatory T cells from the immunized WT and C5aR−/− mice. Three individual experiments were performed. The data are presented as the mean ± SD; *p < 0.05. Recent studies have revealed that complement activation may regulate specific T cell responses by modulating DC function (29, 30). To test the hypothesis that the defective CD4+ T cell response in C5aR−/− mice was a result of impaired DC function, splenic DCs from C5aR−/− mice were analyzed for the activated phenotype and potential to stimulate alloreactive T cells. At resting state, the expression of the three markers, CD40, MHCII, and CD86, was at similar levels between the WT and C5aR−/− mice (Fig. 8A, 8B), excluding the intrinsic defect of DCs in the absence of C5aR. However, the levels of CD40, MHCII, and CD86 on the DC surface were significantly higher in WT mice than those of C5aR−/− mice 2 d after a single immunization with pRBC lysate (Fig. 8A, 8B). When cocultured with naive allogenic T cells, the DCs from C5aR−/− mice induced significantly higher T cell proliferation and IFN-γ production than that of the naive control (p < 0.05). However, both T cell proliferation and IFN-γ production were much lower in DCs from the immunized C5aR−/− mice than those from the immunized WT mice (p < 0.05; Fig. 8C, 8D). Therefore, our data demonstrated that both DC activation and allostimulation of CD4+ T cells were largely impaired in C5aR−/− mice after immunization with the whole blood-stage malaria vaccine. Impaired DC function in C5aR−/− mice following immunization. At days 0 and 2 after a single immunization, splenic DCs were purified from the WT (n = 5) and C5aR−/− mice (n = 5). (A) A representative FACS analysis of the expression of CD40, CD86, and MHCII on DCs from the naive (thin line) and immunized (bold line) WT and C5aR−/− mice. (B) A graphic representation of the geometrical mean of the immunofluorescence intensity of the expression of all three markers. (C) The irradiated DCs were cultured with allogeneic CD4+ T cells for 3 d and pulsed with [3H]thymidine for 8 h, and radioactivity uptake was then measured. (D) The concentration of IFN-γ in the culture supernatants was measured using an ELISA. Three independent experiments were performed. The data are presented as the mean ± SD; *p < 0.05, **p < 0.01. The failure of current blood-stage subunit vaccines is largely due to the extensive antigenic variation and polymorphisms of merozoite surface proteins (1). Recently, a whole-parasite vaccine was reported to protect against both homologous and heterologous parasite infection through the induction of a robust CD4+ T cell response. This may be a novel strategy for the development of an efficacious blood-stage subunit vaccine. However, the underlying mechanism behind this robust CD4+ T cell response induced by the whole blood-stage malaria vaccine is only beginning to be elucidated (15). In this study, we present for the first time, to our knowledge, that immunization with pRBC lysate can efficiently activate complement and generate anaphylatoxin C5a and demonstrated that C5a/C5aR signaling was essential for the protective immunity induced by the whole-parasite vaccine. The reduced protective immunity in C5aR−/− mice was a result of the impaired function of malaria-specific CD4+ T cells and differentiation of memory CD4+ T cells. Additionally, our data suggested that C5a might act through C5aR expressed on DCs to indirectly regulate the activation of CD4+ T cells. It is well established that complement is immediately activated during bacterial and viral infection (31). In the case of infection by the malaria parasite, complement has been shown to be activated and associated with severe malaria in both human and animal models (32, 33). To our knowledge, this is the first report demonstrating that immunization with pRBC lysate can also activate complement, although the level is lower than the activation level during malaria parasite infection (33). Regardless of the pathways involved, activation of C3 is a necessary event in the progression of the enzymatic reaction cascade that results in the generation of the membrane attack complex along with many intermediate products, especially anaphylatoxins C3a and C5a (31). In addition to acting as proinflammatory mediators, growing evidence indicated that both C3a and C5a were of prime importance in the regulation of adaptive immunity (34). In this study, we have investigated the role of C5a/C5aR signaling in the protective immunity induced by the whole-parasite vaccine; however, the role of C3a in this process requires further investigation. Unlike the protective CD4+ T cell response and nonprotective Ab in the whole-killed P. chabaudi chabaudi vaccine (10), we found that our whole-killed P. yoelii 17XL vaccine was dependent on not only the CD4+ T cell response, but also the Ab response (Fig. 2), implicating the different requirements of Ab response in different rodent malaria parasite vaccine models. In addition, we found the levels of IgG1 in the immunized C5aR−/− mice were slightly lower than that of the immunized WT (Fig. 3), which is consistent with a previous report about the effect of C5a on the migration of naive and memory B cells (35). However, there was no significance of survival rate between the naive mice that received serum either from the immunized C5aR−/− or WT mice (Fig. 6), indicating that the impaired CD4+ T cell response did not significantly affect Ab titer or isotype profile. It is interesting to us, and the mechanisms require further experiments in the future. In addition, previous data showed that C5a/C5aR signaling could promote the expansion of antiviral CD8+ T cells (22). Consistent with this observation, we also found that activation of the malaria-specific CD8+ T cells was depressed in the absence of C5aR (data not shown). Although one report recently showed that CD8+ T cells were involved in protection against the blood stage of malaria (36), most studies excluded the protective effect of CD8+ T cells in mice either treated with drug or immunized with a whole blood-stage malaria vaccine (10, 37). Therefore, we did not pursue investigation into the regulatory role of C5a with regard to the activation of malaria-specific CD8+ T cells. Although a previous study reported that C5a was not involved in the induction of CD4+ T cells against L. monocytogenes infection (22), we found that the CD4+ T cell response was profoundly suppressed in the whole-killed parasite-immunized C5aR−/− mice (Fig. 4). This discrepancy may be due to the different infection models used in these studies. Several mechanisms may explain the defective CD4+ T cell response in the immunized C5aR−/− mice. First, both locally produced C3a and C5a may enhance the proliferation and differentiation of CD4+ T cells by providing both costimulatory and survival signals (38). 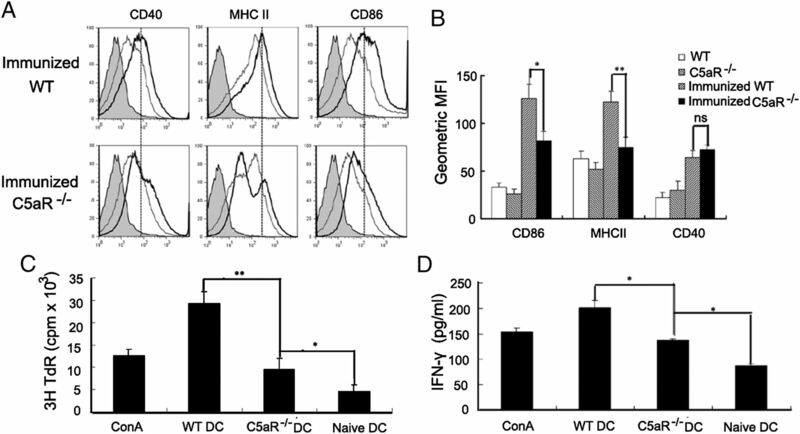 However, we found no significant difference in proliferation and IFN-γ secretion between the CD4+ T cells stimulated with Con A from C5aR−/− and WT mice (Fig. 4A, 4B), indicating that the reduced CD4+ T cell response may not be due to the lack of direct activation of C5aR signaling. Second, C5aR deficiency may indirectly suppress the CD4+ T cell response through the promotion of Foxp3+ regulatory T cell expansion. The expansion of CD4+CD25+Foxp3+ T cells has been correlated with severe malaria through inhibition of the CD4+ T cell response (39, 40). Moreover, C5a acting through C5aR expressed on DCs was recently reported to indirectly promote the expansion of CD4+CD25+Foxp3+ T cells (28). However, the frequency of CD4+CD25+Foxp3+ T cells was increased comparably postimmunization in both WT and C5aR−/− mice in our study (Fig. 7). Therefore, Foxp3+ regulatory T cells may not be related to the observed defective CD4+ T cell response in the immunized C5aR−/− mice. Finally, C5aR deficiency may indirectly regulate the CD4+ T cell response through suppressing DC function. It has been reported that C5aR signaling may enhance DC maturation and capacity to activate CD4+ T cells (30) and that blocking C5aR signaling protected against asthma by downregulation of costimulatory molecules (41). Compared with DCs from the immunized WT mice, DCs from the immunized C5aR−/− mice exhibited a deficiency in maturation, and the capacity to activate CD4+ T cells was also much lower (Fig. 8C, 8D). Therefore, our data supported the observation that the impaired CD4+ T cell response was primarily due to the defective function of DCs in the absence of C5aR signaling. The establishment of long-term memory CD4+ T cells is the main feature of an effective blood-stage malaria vaccine (42). In contrast to circumsporozoite protein-specific CD8+ memory T cells (43), less is known about the regulatory mechanisms of blood-stage CD4+ memory T cell differentiation (44). Therefore, it is interesting to find that C5aR deficiency dramatically reduced both CD4+ effector and central memory T cell numbers (Fig. 5). To our knowledge, the regulation of memory CD4+ T cell differentiation by C5aR signaling has never been reported and the mechanism underlying this phenomenon is unknown. We hypothesized that insufficient activation of malaria-specific CD4+ T cells may be one cause. However, as local activation of C5aR on T cells may enhance effector T cell expansion by limiting Ag-induced apoptosis (45), the direct role of C5a action on C5aR expressed on CD4+ T effector or memory T cells to enhance memory cell differentiation or survival cannot be excluded. Other than complement C5a and C3a, however, the role of TLRs in the regulation of robust CD4+ T cell responses induced by a whole-killed parasite vaccine remains to be determined. pRBC lysate contained the TLR2/4 agonist, GPI (46), and the TLR9 agonist, hemozoin (47). Of these, hemozoin was recently shown to be involved in the immunogenicity of a whole blood-stage malaria vaccine through activation of TLR9 (15); but the role of TLR2 and TLR4 in the induction of a robust CD4+ T cell response by a whole-killed parasite vaccine is still unknown. Additionally, it is also interesting to examine whether synergistic effects existed between the TLRs and C5a/C5aR signaling in the regulation of the CD4+ T cell response induced by a whole-killed parasite vaccine. In conclusion, to our knowledge, this is the first study to demonstrate the critical role of C5aR signaling in the regulation of protective immunity induced by a whole blood-stage malaria vaccine. In addition, unlike L. monocytogenes infection (22), we provide evidence that C5aR signaling can enhance the malaria-specific CD4+ T cell response through modulation of DC function. Although the immunodominant malaria-specific CD4+ T cell epitopes are needed to be defined, these findings have implications not only for the rational design of an effective blood-stage vaccine against malaria parasites through the induction of a robust CD4+ T cells response, but also to further our understanding of the regulation of adaptive immunity by complement. We thank W. Peters and B.L. Robinson from the Malaria Research and Reference Reagent Resource Center for providing P. yoelii 17XL. We also thank Xin-zhuan Su for helpful discussions and critical reading of the manuscript. This work was supported by the Natural Science Foundation of China (30972773), Military Major Project BWS11J041, and the National Basic Research Program of China, 973 Program 2007CB513105.
. 2007. Asexual blood-stage malaria vaccine development: facing the challenges. Curr. Opin. Infect. Dis. 20: 467–475.
. 2009. Blood stage malaria vaccine eliciting high antigen-specific antibody concentrations confers no protection to young children in Western Kenya. PLoS One 4: e4708.
. 2009. A randomized controlled phase 2 trial of the blood stage AMA1-C1/Alhydrogel malaria vaccine in children in Mali. Vaccine 27: 3090–3098.
. 2011. Evidence for erythrocyte-binding antigen 175 as a component of a ligand-blocking blood-stage malaria vaccine. Proc. Natl. Acad. Sci. USA 108: 7553–7558.
. 2009. Safety and immunogenicity of GMZ2: a MSP3-GLURP fusion protein malaria vaccine candidate. Vaccine 27: 6862–6868.
. 2006. Enhancement of functional antibody responses to AMA1-C1/Alhydrogel, a Plasmodium falciparum malaria vaccine, with CpG oligodeoxynucleotide. Vaccine 24: 2497–2505.
. 2010. Advances and challenges in malaria vaccine development. J. Clin. Invest. 120: 4168–4178.
. 2007. Genome-wide variation and identification of vaccine targets in the Plasmodium falciparum genome. Nat. Genet. 39: 126–130.
. 2010. Low doses of killed parasite in CpG elicit vigorous CD4+ T cell responses against blood-stage malaria in mice. J. Clin. Invest. 120: 2967–2978.
. 2008. Attenuated Plasmodium yoelii lacking purine nucleoside phosphorylase confer protective immunity. Nat. Med. 14: 954–958.
. 2010. Subpatent infection with nucleoside transporter 1-deficient Plasmodium blood stage parasites confers sterile protection against lethal malaria in mice. Cell. Microbiol. 12: 930–938. 2011. A whole parasite vaccine to control the blood stages of Plasmodium: the case for lateral thinking. Trends Parasitol. 27: 335–340.
. 2010. Immunogenicity of whole-parasite vaccines against Plasmodium falciparum involves malarial hemozoin and host TLR9. Cell Host Microbe 7: 50–61.
. 1996. C3d of complement as a molecular adjuvant: bridging innate and acquired immunity. Science 271: 348–350.
. 2002. 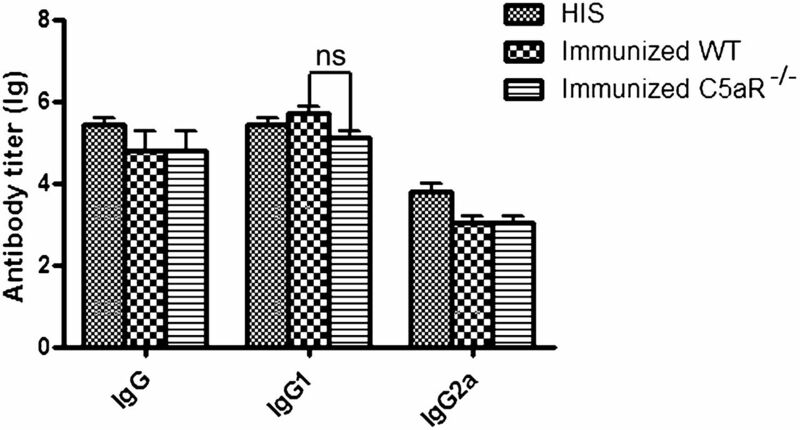 Complement receptors CD21/35 link innate and protective immunity during Streptococcus pneumoniae infection by regulating IgG3 antibody responses. Immunity 17: 713–723.
. 2007. T-cell regulation: with complements from innate immunity. Nat. Rev. Immunol. 7: 9–18.
. 2002. Local synthesis of complement component C3 regulates acute renal transplant rejection. Nat. Med. 8: 582–587.
. 2003. Complement component 3 is required for optimal expansion of CD8 T cells during a systemic viral infection. J. Immunol. 170: 788–794.
. 2009. C3 promotes expansion of CD8+ and CD4+ T cells in a Listeria monocytogenes infection. J. Immunol. 183: 2921–2931.
. 2002. Identification of a potent and orally active non-peptide C5a receptor antagonist. J. Biol. Chem. 277: 49403–49407.
. 2005. Heterologous immunity in the absence of variant-specific antibodies after exposure to subpatent infection with blood-stage malaria. Infect. Immun. 73: 2478–2485.
. 1998. Dendritic cells interact directly with naive B lymphocytes to transfer antigen and initiate class switching in a primary T-dependent response. J. Immunol. 161: 1313–1319.
. 1994. Mapping of the C5a receptor signal transduction network in human neutrophils. Proc. Natl. Acad. Sci. USA 91: 9190–9194.
. 2007. Macrophage-mediated but gamma interferon-independent innate immune responses control the primary wave of Plasmodium yoelii parasitemia. Infect. Immun. 75: 5806–5818.
. 2010. C5a receptor-deficient dendritic cells promote induction of Treg and Th17 cells. Eur. J. Immunol. 40: 710–721.
. 2006. Dendritic cell synthesis of C3 is required for full T cell activation and development of a Th1 phenotype. J. Immunol. 176: 3330–3341.
. 2009. Dendritic cell function in allostimulation is modulated by C5aR signaling. J. Immunol. 183: 6058–6068.
. 2010. Complement: a key system for immune surveillance and homeostasis. Nat. Immunol. 11: 785–797.
. 2008. C5 deficiency and C5a or C5aR blockade protects against cerebral malaria. J. Exp. Med. 205: 1133–1143.
. 1997. Complement activation in severe Plasmodium falciparum malaria. Clin. Immunol. Immunopathol. 85: 166–171.
. 2010. Role and mechanism of action of complement in regulating T cell immunity. Mol. Immunol. 47: 2176–2186.
. 1999. rC5a directs the in vitro migration of human memory and naive tonsillar B lymphocytes: implications for B cell trafficking in secondary lymphoid tissues. J. Immunol. 162: 6510–6517.
. 2003. Vaccination with novel immunostimulatory adjuvants against blood-stage malaria in mice. Infect. Immun. 71: 5178–5187.
. 2008. Locally produced complement fragments C5a and C3a provide both costimulatory and survival signals to naive CD4+ T cells. Immunity 28: 425–435.
. 2004. Escape of malaria parasites from host immunity requires CD4+ CD25+ regulatory T cells. Nat. Med. 10: 29–30. 2005. Identification of early cellular immune factors regulating growth of malaria parasites in humans. Immunity 23: 241–242.
. 2009. A protective role for C5a in the development of allergic asthma associated with altered levels of B7-H1 and B7-DC on plasmacytoid dendritic cells. J. Immunol. 182: 5123–5130.
. 2005. Plasmodium yoelii can ablate vaccine-induced long-term protection in mice. J. Immunol. 175: 2510–2516.
. 2007. T cell memory in malaria. Curr. Opin. Immunol. 19: 424–429.
. 2010. Effector memory Th1 CD4 T cells are maintained in a mouse model of chronic malaria. PLoS Pathog. 6: e1001208.
. 2008. Locally produced C5a binds to T cell-expressed C5aR to enhance effector T-cell expansion by limiting antigen-induced apoptosis. Blood 112: 1759–1766.
. 2005. Induction of proinflammatory responses in macrophages by the glycosylphosphatidylinositols of Plasmodium falciparum: cell signaling receptors, glycosylphosphatidylinositol (GPI) structural requirement, and regulation of GPI activity. J. Biol. Chem. 280: 8606–8616.
. 2005. Toll-like receptor 9 mediates innate immune activation by the malaria pigment hemozoin. J. Exp. Med. 201: 19–25.